The crown of the tooth which is the part of the tooth you can see in the mouth and the root system which extends down into the bone of the jaw and anchors the tooth into position in the mouth. The root canal system contains the dental pulp and extends from the tooth crown all the way down to the end of the root. A single tooth can have more than one root canal. The pulp of the tooth is composed of soft tissue. The soft tissue includes nerves and blood vessels. 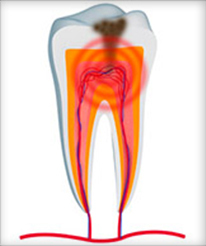 When bacteria gets into the root canal system it can infect the pulp and the pulp will start to die. When that happens the bacteria multiplies. Eventually the bacteria and the waste they release will pass out of the end of the root canal through the small hole where the blood vessels and nerves enter the tooth. This in turn causes the tissue around the end of the tooth to swell and become red. When this happens your tooth becomes very painful and in some cases the face may also begin to swell up. Endodontics therapy involves a sequence of treatments to get rid of the infections and toothache that are affecting the pulp of a tooth. Root canal or endodontics therapy removes the bacteria from the root canal system. Endodontics cleans, shapes and decontaminates the hollow areas with tiny files and irrigating solution. Root canals ease the toothache so the pain is relieved and you are once again your happy self. After the hollows are thoroughly cleaned they are filled with an inert material and then the tooth is sealed with a filling or a crown. The inflamed tissue at the end of the tooth normally heals without further treatment. Our dentists are experts in root canal therapy and we make it completely comfortable for our patients. 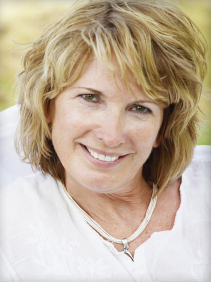 The procedure has a success rate and most teeth can survive up to 10 years after a root canal treatment.